Personal Property 4 p.m. • Real Estate 6 p.m. This 11.1 acre tract is partially wooded (approx. 4 acres) and has approx. 6 acres of tillable farm ground (both hay and row crops). The house is of frame construction with cedar siding. It is 1214 sq. ft. and built on a cemented crawl space. 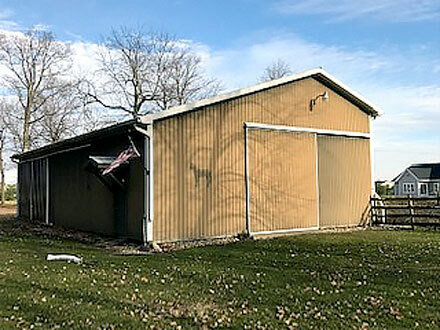 There is also an attached 24' x 24' garage. There is a very large kitchen/living room area, very large bedroom and a smaller bedroom. There is one full bath along with shower in the utility room. There are also varied porches. The house has had excellent care and is well-decorated. Also on this super property is a 36' x 56' pole barn with four horse stalls, a water hydrant and tack room. There is a large loft for hay storage. There is also a 16' x 17' lawn and garden shed. Some of the property is fenced, some is in hay and some rented as cropland. 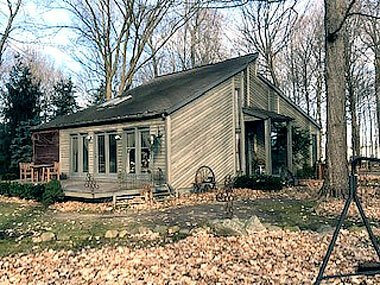 This is a must-see property, so inspect, arrange financing and be a bidder on the country property close to Goshen, IN.